After my first taste of a sautéed Spanish padron pepper a couple years ago, I knew I had to grow them in the garden. Our first plant grew well, but only produced a few peppers, hardly enough for a tapa. The second year was slightly better, then this year I decided to go all out and try growing three plants to see how many padrons we would get. Let’s just say we haven’t run out of padrons in several weeks. 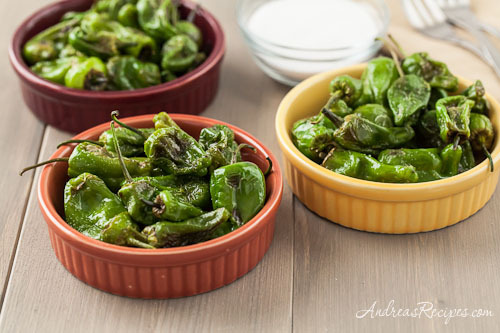 If you can find padrons at your farmers market, or better yet grow your own, you can treat yourself to this delicious appetizer, Spanish padron tapa. It’s ridiculously easy, you just need a large skillet, a little olive oil, some padrons, and a little sea salt. They sauté up in about 5 minutes, and then you get to play roulette as you taste the padrons to find out which peppers are hot. A good beer goes well with this little dish. We’ve accidentally missed a few peppers when picking, and they grew very large and got very hot. If you are growing padrons and find that they’ve gotten too large for tapas, you can use them as a substitute for other spicy peppers. Summer is almost over and the padrons are slowing down, so we only have a few more weeks to enjoy these treats. Smaller padron peppers work best for this, no longer than one inch long. 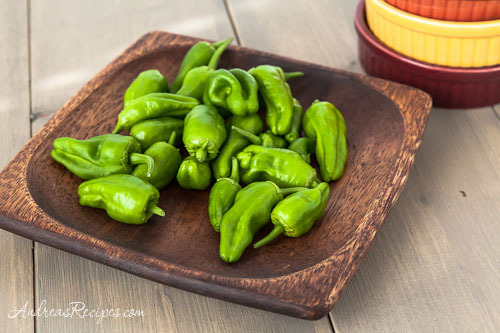 Use the freshest padron peppers you can find, it really does make a difference in the flavor, and don’t sauté them too long or they will take on a bitter taste. Drizzle the olive oil around a medium-hot skillet. Add the padron peppers and sauté, stirring and tossing occasionally, until all the peppers are blistering and slightly browned, about 5 minutes. Transfer to small plates and sprinkle with a bit of sea salt, then serve. I love these and never thought of growing them. Love those little tapas dishes too! Thanks Kalyn. I’ve enjoyed having them in garden, practically no work at all, just plant and harvest. I’m tring this recipe ; it seems delicious, it’s in the oven for a few hours. I’m french and I love the idea recipes travel around the world.